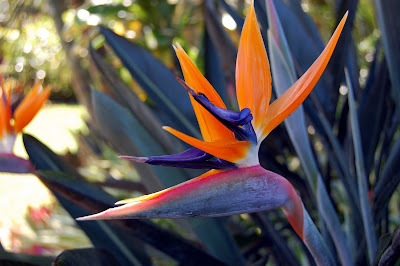 Juanita took this picture of a Bird of Paradise at the Dole Plantation garden on Oahu. It's a beautiful picture. However, if you look closely, you'll see that there is an ugly bug on one of the blue petals and some smaller bugs on the back of the far right petal. Maybe you like bugs, but I don't. The bug on the Bird of Paradise is kind of a life metaphor. In this fallen world, even the most beautiful things have bugs on them. There's one more thing about the Bird of Paradise flower that our guide told us: It grows an new part of the flower every day for four days and then it dies. Talk about life metaphors. The word "Paradise" is thrown around in Hawaii quite freely. It is indeed a beautiful place, but they still have traffic, pollution and evidence of sin and death all over the place. We even came across what looked like a drug deal one evening (one of the guys yelled at us, "Aloha! Which means get out of here ..."). While I enjoyed Hawaii, it made me long for the real Paradise even more. This reflection has raised a tension in my mind. It's like the tension that the Apostle Paul shares with us in Philippians 1:23, I am hard pressed between the two. My desire is to depart and be with Christ, for that is far better. But to remain in the flesh is more necessary on your account. The tension heightens when we consider that this is the same Apostle that told us, For everything created by God is good, and nothing is to be rejected if it is received with thanksgiving (1 Timothy 4:4). As we are told in other places in Scripture (like Ecclesiastes), it is good to enjoy life as a gift from God. For most of my Christian life, I've envied "Heavenly minded" Christians. I don't like the line "so heavenly minded that he's no earthly good," because I'm convinced that the problem with most Christians is the exact opposite. We do live as if this life were everything. Since Emily's death, I've had (almost in an instant), a greater longing for Heaven. I'm learning that my sinful heart can put bugs on the most beautiful flower, however, and I'm struggling with the sin of not appreciating God's good gifts and beauty right now. It is a very good thing to take time to reflect on the blessings that God gives. I don't want to mope around and just exist until the Lord returns or I die. I don't think I've been doing that yet, but the temptation is very real. As a family, we did really enjoy taking time to enjoy the beauties of God's creation in Hawaii - fish, birds, ocean, flowers, trees and sky. There was a person missing in that trip, but Emily's absence didn't ruin our time - not at all. We made some great memories, and we have a bunch of pictures and stories to enjoy for a long time. I'm learning about what's eternal, more and more. By God's grace, I hope I will also cultivate a greater love for people and a deeper appreciation for God's everyday blessings while I wait for the Real Paradise. I like this post. It's a strange sort of tension we live in, isn't it? I think that the longing for heaven actually helps us enjoy the beauty of the here-and-now, because we no longer expect the here-and-now to be the whole cause of our joy. And we lose our fear of the moments (and what they contain) passing away. Thank you for your comment, Rebecca. Yes, that is so true. I think my anxiety may be reduced by reflecting on that fact. Enjoying the here-and-now as a secondary beauty - a kind of reverse echo of what's to come! I do think we long more for heaven as it becomes populated with those we love. We continue to pray for you and Juanita and your children daily, and ask God to shed His beauty into your daily walk in the here and now! Thank you for this wonderful reflection. You are right, our true Paradise is with Him. A very beautiful photo with deep meaning that you spoke from your heart. The irony of Life so contrasted is indeed a mystery. You're holding onto the Lord and He will always be with you. Thank you for having the courage to share what's on your heart. I continue to pray for you and your loved ones.